Brandon, you can see the information I have on Riverside Park on my Riverside Park site on Facebook. I bought a house last year at the end of what would be Riverside Park. The house was built in 1920 and maintained for 56 years by the previous owners I purchased it from. I'd like to learn about more history of the area as Green Point. Hello! My grandfather was Arthur Hickey owner of Hickey Oldsmobile in saginaw mi- his father- my great grandfather was the owner of Riverside park. My uncle Art Hickey Jr. was the last person in our family to own it. My grand father built a house out there and I'm not sure what has become of it- I spent many days out there as a kid playing around and explorering. As I got older I mowed there for me uncle and always found coins and tokens in the dirt. I've got lots of original pictures of the grounds back when the canoe club was still open. We also have in our family the original glass French doors that were inside the club- lots of awesome stuff. I'm proud to say it was my grandparents who created so much enjoyment for many generations. I currently am the owner of DJ'S Detailing in saginaw at 7711 Gratiot rd. Stop in anytime if you ever want to talk about the park or could give me a history lesson! I'm young- only 27 so I don't know much about it other than what I've been told throughout my life. We found the park by accident 45 tears ago when we were teenagers. We thought we had entered the Twilight Zone. A roller skating rink, stables, tack room and a fenced riding area, rides and remnants of rides all over the place. It was unbelievable. We went skating after finding some old skates that fit. There was a 10ft stuffed Polar bear in mint condition inside the rink near the entrance. We were going to steal it but that was just a Pipe dream We also found a 1947 olds in perfect condition under a raised building. It had a Hickey plate on it. Weird. Train tracks that led to a turn table told us how popular this must have been. I would love to go back and search the picnic area by the river with a metal detector. what a treasure trove that would be. DK. I'm a Metal Detectorist and would love the opportunity to hunt your property for relics. Please feel free to contact me at any time edmillsvp@yahoo. com. Thanks DK I will contact you soon. GO, There are few remnants of the park. A big slab of cement where the roller rink used to be. I can tell where a boat landing once stood. As Lee suggested in a previous post, I talked with Herman at the Historical Society. I found I work with his daughter. He came out one day and walked the grounds. He was kind enough to give me copies of many documents detailing the history of the park. VERY COOL! What a place it was at one time. Now I get to see bald eagles across the river in the wildlife refuge. Hi GO, Sure you can stop by any time. Find anything DK? I would like to visit the grounds. Any Chance? :). My father, Jim M Cox, born in 1920, told me that there was a trolley line that went right out to Riverside Park along a route that would be South Michigan Ave and then past Merrill Park on Maple Street. He said that one of the rides went right out over the river. I can remember going to Riverside as a child in the '50s for one day special events, such as church or school or union picnic days. There were no remnants of the park then except for what used to be a roller skating rink. He said that, in its day, it was quite the place to be. I bought the property where the park used to be in August 2011. A new house was built there in 1977. The house that used to be the Canoe Club is still standing. It is in bad shape. I'm finding some bits and pieces of lamp posts in the river that used to be along the river. I'm sure a metal detector will soon become one of my favorite tools. Who knows what will be unearthed!. A reply to David: Riverside Park was located near where Green Point Nature Center is today. If you go past the Green Point entrance, and past the golfcourse, the road bends to the right. At the end of the road is the river and is where the park was. The area is private now and there's a few homes back there. I recall my father saying that there used to be remnants of rides still laying around back in the late 50's. 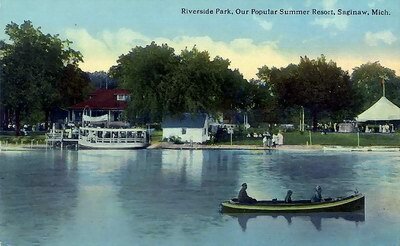 Is modern-day Imerman Memorial Park the site of historic Riverside Park? Looking at a map, it would seem to be logical, as it''s a site along the Tittabawasee that was likely accessible by streetcar in that era. Greetings: If you want more info on Riverside Park talk to Herb that works at Castle Museum In Saginaw. He worked there taking care of the ferris wheel. When I get to Saginaw always stop and talk to Herb,Tell him I said HOWDY. REgards Lee. 1894 Riverside Park opens on Green Point. Merry-go-rounds, roller coasters, balloon ascensions, pavilion dancing - served by Union St. Railway. All vanished, without a trace. New York had Coney Island on the seashore and Pittsburgh had Kennywood Park near the Monongahela River. Sandusky had Cedar Point on the shores of Lake Erie, and Bay City had Wenona Park on Saginaw Bay. But Saginawians enjoyed Riverside Park on the banks of the Tittabawassee River. Between 1894 and 1937 Saginaws Riverside Park provided area residents with a place to enjoy a summer day. 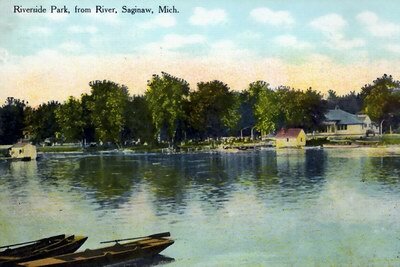 In 1903 Riverside Park officials boasted that the park was indispensable for Saginaw residents. That year, to further add to the publics enjoyment, a new Roller Coaster was built for the park by Ingersoll Construction of Pittsburgh, who had built a similar ride for Kennywood Park. The thrilling Circle Swing was a popular sensation at Luna Park at Coney Island, and both Saginaw and Bay City had one of these popular rides. 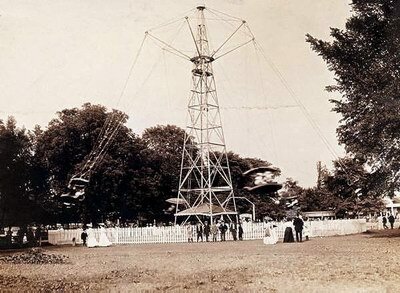 When Riverside Park built its circle swing in 1905 there were only 16 others in operation. Bay Citys Wenona Park had installed theirs in 1902. It was said not a single accident had occurred up to that time. The passengers were buckled in and the centrifugal force kept them from falling out. When the speed was increased the cars were said to whiz through the air at railroad speed. 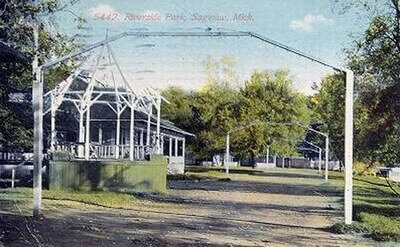 The carnival rides and amusements at Saginaws Riverside Park rivaled those of similar parks nationwide. For Saginawians fun was at the end of the trolley line on the banks of the Tittabawassee.